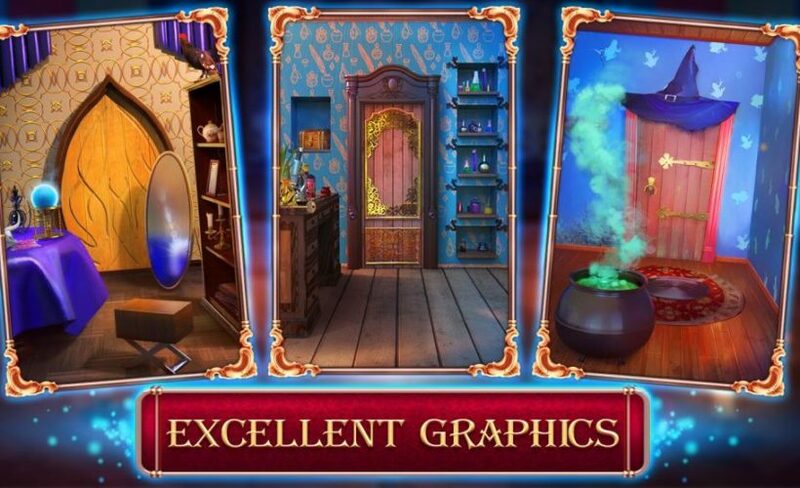 There’s a brand new puzzle adventure game available on mobile, Magic Academy: The New Adventure. 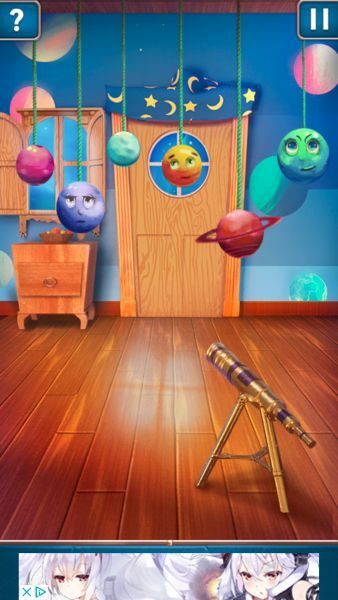 Created by Zenfox Games, experts in escape the room adventures, this one challenges us with tons of levels and amazing puzzles. But we’re here to help with a complete Magic Academy: The New Adventure walkthrough. And in today’s article, we’re going to check out the solution for the first 20 levels in the game: the Magic Academy: The New Adventure walkthrough for levels 1 to level 20. It’s true that most of these starting levels are very easy to complete, but they get a bit more difficult after level 10 or so, so you might need our help here. Tap the star above the door and exit. Tap the plants until they are removed, then open the door and exit. Drag the cover over the cauldron, then drag the key that appears on the shelf onto the door. You can now exit safely. Swipe over each window on the door until all 4 of them are clean. Exit the room. Look at the bags to the sides of the door for the password: 3543. Simply tap the dial on the door and enter that password. Tap the wheel right to the door and swipe over the screen, turning it until the door opens. Tap the piece of paper on the book to zoom in to it. Then tap the symbols above the door in the order indicated by the piece of paper. Tap the broken shield on the bottom and put it back together by completing the simple puzzle. Tap the golden bag on the dresser to the left to reveal a key. 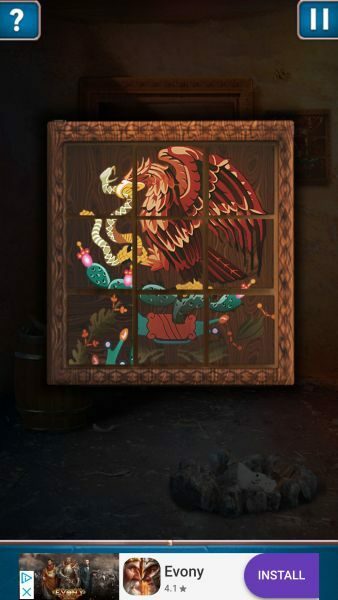 Tap the painting near the door and drag the key over the chest. A new key appears near the golden bag – drag it over the door to open it. Shake your device to see the next symbol you have to tap, shown on the crystal ball. The order might be randomized each time, but in my case it was: star, lightning bolt, sun, planet and moon. Tap the basket to drop the fruits. Count them by colors and you get the password: 5346. Tap the piece of paper on the floor to see the recipe. Then, tap the red ball on the shelf to make the cat disappear – then drag the mushroom into the cauldron. Then, from the shelf drag the root, then drag the frog and bird’s wings from the lines above. Finally, drag the bowl on the chair over the cauldron, then the filled up bowl onto the door. Tap the stones to move them away, then tap the green gem until the key is revealed – use it to exit the door. Behind the chimney, right above the bottom cogwheel, there’s a ladle hidden – drag it into the bucket and then on the lock. Tap the metal pipe at the bottom left of the screen and drag the key over the lock. Drag the ladle once more into the fire and use the key to exit. This goes with a bit (or a lot) of trial and errors. 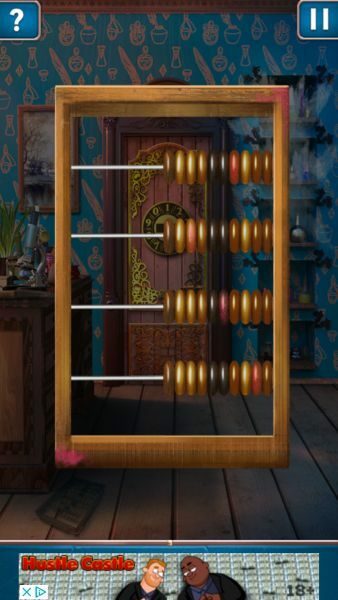 You will need to tap the scrolls in order, from 1 to 8. There’s no knowing which one is which, but simply tap them and remember the roman numbers (I, II, III, IV, V, VI, VII and VIII). They might be randomized each time you play, but in my case, the correct order was: scroll on the floor in the upper left side, scroll on the top right shelf, scroll on the bottom left shelf, bottom left floor, bottom right floor, top right floor (behind the wooden desk), top left shelf and bottom right shelf. 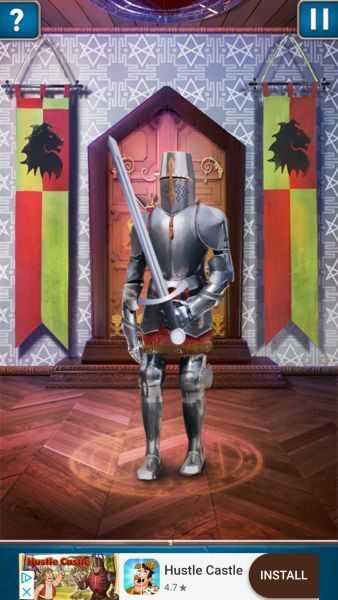 Tap it to break it and drag the sword over the door to open it. Drag the knife on the dresser over the bags to cut them: 4 are on the shelves next to the door, while the fifth is hidden towards the bottom left foot of the door. Tap the cards on the table. Your goal is to guess the card with the key – but there’s no way of knowing. Simply tap cards randomly to miss the right card for three times in a row. Once you have chosen a card position, you won’t be allowed to choose it next time. Eventually, you will get the right card that opens the door. This is it for now. We’re working on opening the rest of the doors as well, and we will publish the rest of the solutions on our website, so make sure to check back often if you need them! Update: 10 more levels have been solved and published on our blog. Click here to check out the walkthrough.